I've had my Aussie boss visiting here for the last few days. He was good enough to bring a packet of chewy-caramel-centred Tim Tam's and a bag of Fruchocs all the way from Australia for us to share. Yummo! The Chinese currency is officially called the Renminbi, or RMB. Translated, it means "The People's money". There's an excellent site that shows all the different notes and coins here. There's some formal and informal names given to the different values, so here's a list. Yuan - The formal name for the single currency unit. It's available in coins that are a bit smaller than our 20c piece and manky notes. It's the equivalent to our word dollars. Today, 1 Aussie dollar buys you 6.24 Yuan. Kuai - Pronounced kwai, it's the informal name for the Yuan. It's the equivalent of our word 'bucks'. Ironically, the same word spoken with the same tone means 'fast'. Fen - Worth 0.01 Yuan, or 0.16 Australian cents. These little buggers can be quite annoying because they're not useful for much except for putting under the leg of a table that rocks back and forth in a restaurant. Counterfeiting of the money, as you can imagine, is a huge problem in China. The largest note is the 100 Yuan (AU$16.50) and because of this there's copies everywhere. The next largest note is the 50 Yuan and this one is heavily copied too because it's usually given in change for something paid for with a 100 Yuan note. Even copied 1 Yuan coins can be found and I've had the ticket ladies on the buses reject them. Most ATM's in well-to-do areas deliver brand new 100 Yuan notes and these make some shop-keepers very suspicious. Having the same values available in both notes and coins presents a small problem. Some provinces seem to prefer the notes, others the coins. Even here in our Guangdong province the people of Shenzhen prefer coins whereas 1 1/2 hours away in Huizhou they prefer notes. I prefer the coins every time. Many people don't seem to try and preserve the notes at all. They simply grab at them and scrunch them. Sometimes a store owner will remove a ball of notes from their pocket and then just keep un-scrunching until they find the one they want, then scrunch them all back up again. The crusty, disgusting, disease-ridden, manky, scrunched, torn, polluted, rotten and ghastly state that some of the small value notes can get themselves into is truly disgusting. The sooner China gets with the 20th century and moves over to plastic money, the better. China is the only place in the world that I know of where the gap between the rich and the poor is growing, not shrinking. Sure, many who were poor now have money but those who are rich are grotesquely rich. The rich are getting richer faster than the poor are getting out of poverty. 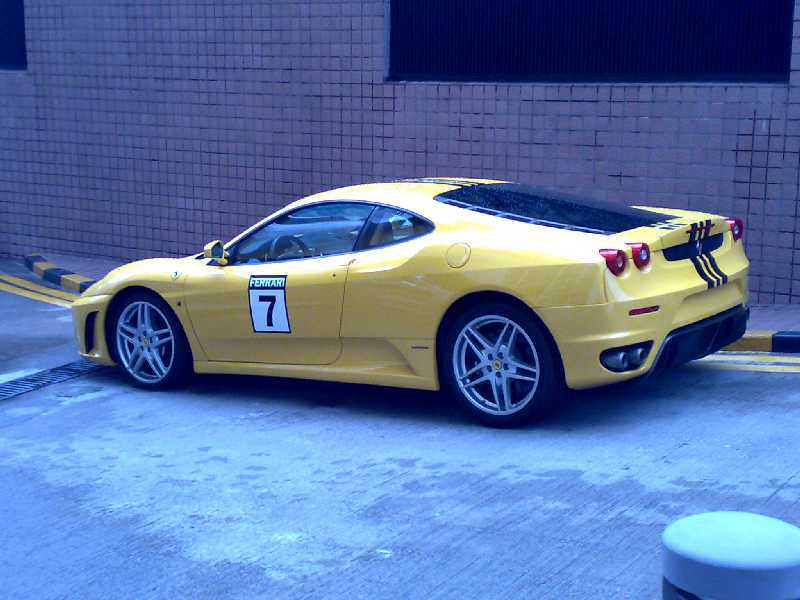 I snapped this Ferrari F430 outside our apartment complex. Parked in front of it was a Mini Cooper S and sometimes a Porsche Cayenne makes an appearance. Less than 50m away there are often beggars at the Metro escalators, just trying to survive. So much for communism distributing wealth evenly. Well, it was too good to last. For nearly a month now we've enjoyed blue skies and clean air with some lovely on-shore breezes. Sadly, this has come to an end. A few days ago the wind changed direction and it is now, once again, dragging all that lovely China air pollution back down over us. Last Saturday in Hong Kong it was so bad that you could see the haze when looking at the buildings across the street. The biggest thing I've noticed is that the polluted air makes me tired, like my energy is being sapped up into the air like I'm being attacked by a dementor. I just hope there's enough life left in me when I finally leave this place. 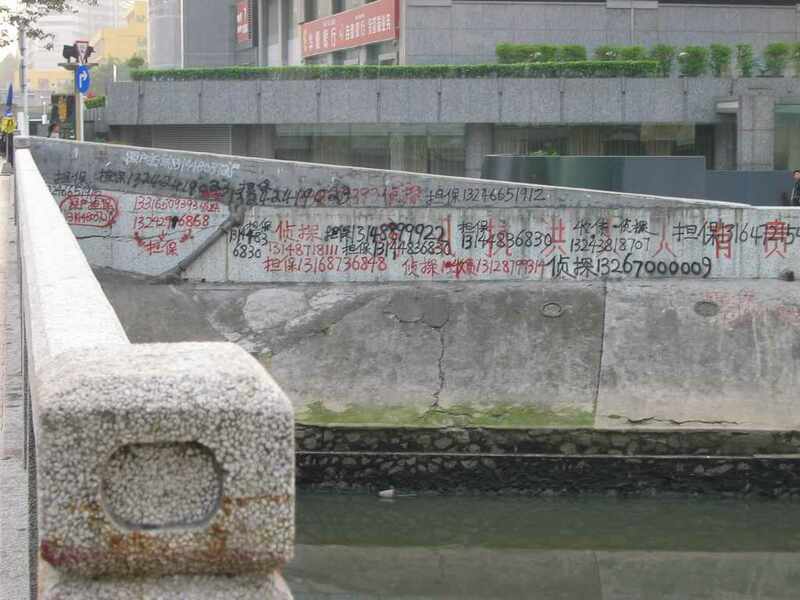 On the side wall of The Defiled Watercourse there is usually a list of telephone numbers. Every once in a while they get painted over and, over a period of time, they slowly grow again. This is not the only place that this occurs in Shenzhen. People write telephone numbers on the footpath, on bus stops, on the walls of buildings, on the walls of construction sites and many other places. I was in a bit of a quandary as to what all these telephone numbers could mean. Surely they didn't think that anyone would be daft enough to actually call one of them? I quizzed a local on the subject. He said that these telephone numbers are for people who will make fake official documentation. Dial up one of these people and, for a fee, you can have a fake drives licence made, a fake city ID, fake University degrees and fake just about anything else. It looks like it's quite a booming industry.